This entry was posted in "Four legs good", Déjà vu, Random Stuff and tagged Caswel-Massey, Fa, Sandalwood Soap. Bookmark the permalink. We had a soap in the UK that looked just like Fa but for the life of me I can’t remember the name. I never used soap, but my dad uses Imperial Leather to this day and they always had TV ads that appealed to me as a child. Purrfect posting from Rusty yet again. You have never used soap? It’s unexpected: I’m not sure I shower gels existed before I was in my mid- to late twenties :) And my vSO has never warmed up to using them: he claims he can’t wash them off completely. 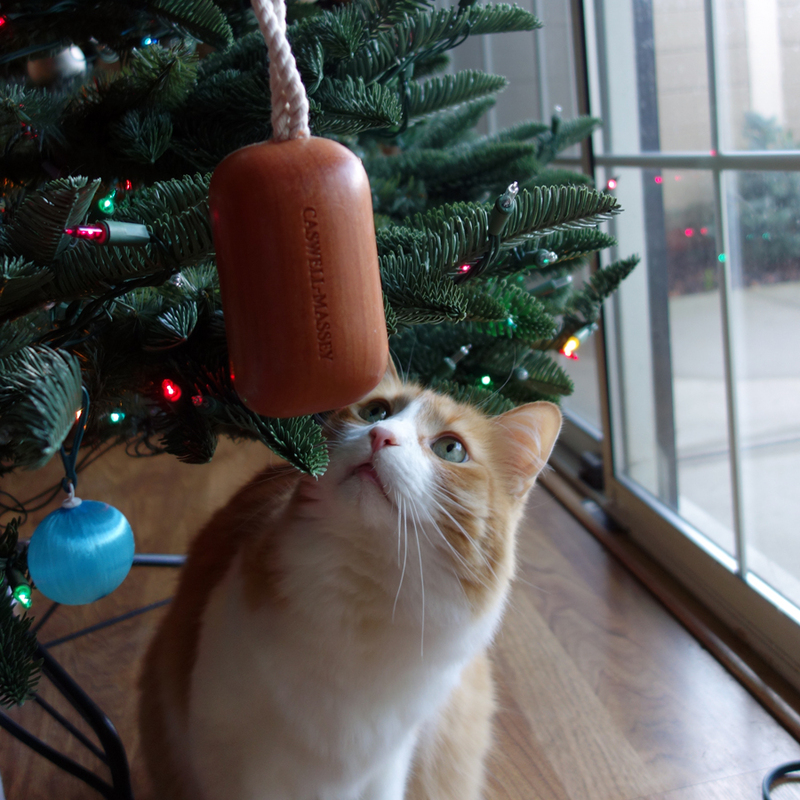 Rusty was extremely curious about that new “ornament” when I put it on the tree, so it wasn’t hard that time to take pictures of him and the object of the future post. Good morning on Monday sweetię! Fa soaps were very popular in Poland in late 90’s. I remember we were using those at home. They are still very present on the market here but people tend to go for liquid soap rather than bar nowadays. I was not familar with Caswell-Massey brand and the idea of a soap on a roap is also not very well known here. You use it in the shower instead of gel, am I right? You made me smile with “use it in the shower instead of gel” part: you use it in the shower instead of regular soap :) (see my response to Tara above). 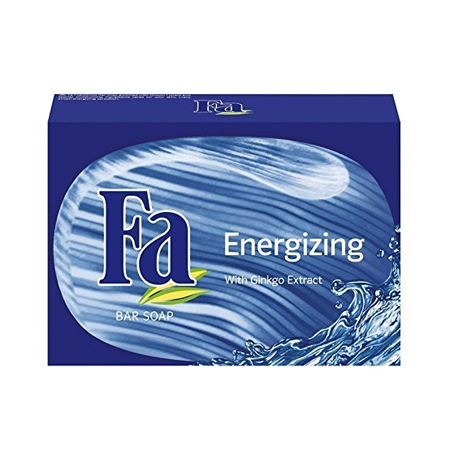 Had Fa produced that original type of soap, I would have been buying it still. I remember soap on a rope from childhood, although I have no idea what it was . We stopped using bar soap because combined with our hard water we were getting tons of residue in the bathtub. Shower gels for all. I think I have had some Caswell-Massey hand cream before, but haven’t seen it recently. I tend to use small wrapped soaps in my dresser drawers like sachets. By coincidence Robin published in today’s lemming post about this brand and their lilacs soap… I’m thinking about it now. I use shower gels when I come across the one that I like, but I enjoy this soap as well, so sometimes I use t just to get that faint scent on my skin. In the 90s, I used to subscribe to a magazine called Victoria which featured short articles on all manner of beautiful things, most of them related to the home, and they often mentioned Caswell-Massey in their articles – perhaps because Caswell-Massey was also one of their regular advertisers. I don’t think I ever tried anything from them, but I got the impression that their soaps were especially luxurious. Your sandalwood soap-on-a-rope description sounds like it is not only luxurious but very long lasting! Another brand prominently featured in this magazine was Crabtree & Evelyn, which was accessible where I lived at certain gift shops, and I loved and used a number of their soaps, particularly their Rosewater Glycerine soap, now discontinued. We do not have any Crabtree & Evelyn stores around here so I had some of their products given to me as a gift ones but other than that I’m not familiar with that brand. But as I read in that Wikipedia article about C-M, C&E was one of their competitors that contributed to their demise. As to this soap, I can’t believe how long lasting it is! I think that hanging and drying quickly after each use prolongs its life. Oh my God. I remember Fa soap. I seem to remember a green package. And, my mom bought me soap on a rope from Avon many, many years ago. And you are absolutely correct about the manliest of men having no problem using perfumed soap. My dad loved Camay and Cashmere Bouquet! Fa soaps came in at least 3 or 4 different colors but that “for men” was my favorite. Until I started writing this post, I have never thought about how unisex soaps were in older days. Though, most modern liquid soaps also lean feminine, if to follow classification similar to what we use for perfumes. I used to use a soap in India called Mysore Sandalwood, and I found it again when I lived in Singapore. It was inexpensive but smelled very luxurious. Interesting that Caswell and Massey is reintroducing. I noticed I’d gotten several emails from them, as I somehow landed on their mailing list. I’m tempted to try some other of their products. I’m even interested in perfumes but they don’t sell samples. That soap looks amazing. I love sandalwood soaps with a passion, the browner the better. I had a Roget & Gallet one that turned white eventually to my great disappointment. I may have to seek this out. It is a very good soap, I’m surprised I got it without any research or recommendations. And it keeps both the scent and the color “until the last drop” – which wasn’t the case with Jo Malone soaps that were of the same price, if not more expensive. I didn’t know this brand, but much prefer old fashioned soap bars to soap dispensers. Soap on a rope is very smart though, I’ll look out for it. I think it’s a smart move. Next time I travel, I’ll be looking for a soap, not perfume: I think I’m much easier to please when it comes to soaps, and any mistake won’t be too costly. Had other brands produced nice soaps on a rope, I would have been buying and using more of those: it’s really convenient and … frugal if you calculate the price per use. I have never used soap on a rope; yours looks amazing. I believe Twisted Lily sells soap on a rope but I am too lazy to look to see what brand. 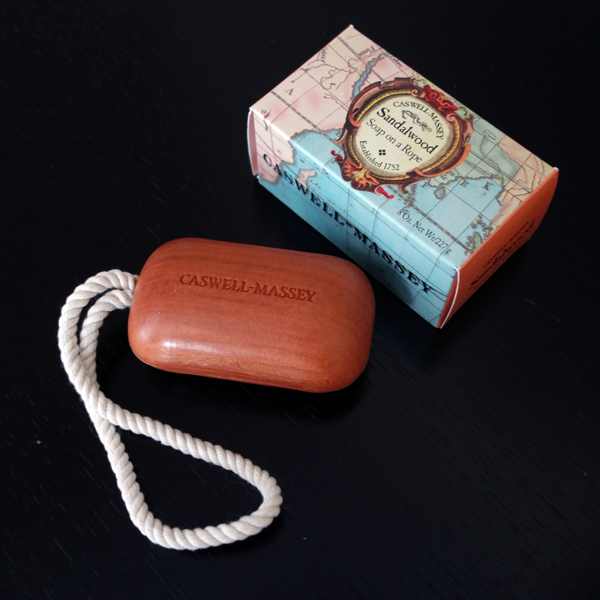 The Sniffapalooza gift bag from 2 years ago featured a huge bar of triple-milled Caswell-Massey soap. I think I gave it away as I have a ton of soap already. For what I call Soap that never dies, I highly recommend Atelier Cologne and Roger & Gallet! Yeah, I saw those soaps but I do not know the brand. They even have a brown one (amber) but it’s twice more expensive than you can get Sandalwood from Amazon (with free shipping). Atelier Cologne soaps are next on my “to try” list. Thanks for the info, Undina. I have never heard of the Caswell-Massey brand before. I’m not really a soap-on-a-rope kind of guy. But I do enjoy a good sandalwood soap. I tried one recently from India, but can’t remember its name. Isn’t that strange (and maybe even sad) that one of the oldest companies in the U.S. isn’t known outside the country – and it’s in our Internet age! On the other hand, it would have been really boring if we all used the same brands, ate the same food and wore the same perfumes. I deeply enjoyed this post. I’d never heard of this company either, and I’m ashamed. Fair enough! Still, now I wonder what the three oldest are? I’ll have to go look it up!